Credited with 60 kills and 73 victories, ‘Mick’ Mannock’s plane burst into flames and fell behind German lines in World War One. There were only four months left until the end of the Great War. His body was never recovered, but his life is remembered by a memorial plaque at Canterbury Cathedral in England. A dance of tragedy and brute desire to survive; Mannock’s life symbolizes the struggle within us to make the most out of the life we are given. Edward Mannock was the son of a Scottish corporal in the British Army who fought in the Boer War. After the war was over, Edward senior abandoned his family of four. Edward junior was relieved that the alcoholic and violent moods of his father would no longer be a part of regular family life. He and his brother were left to provide for the family. A higher education for the boys was no longer an option. Mannock was twenty-seven when World War One broke out. Working in Turkey as a telephone engineer at the time, he attempted to return to England to enlist, but was imprisoned for eight months as an enemy of Germany. Close to death in prison, it was found prudent to send Mick home to England. Once home he joined the British Army, but due to his health was considered unfit for military duties. Undaunted, Mannock joined the Royal Engineers, but found his calling in August 1916 when he transferred to the Royal Flying Corps. 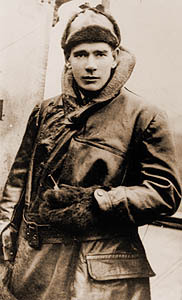 A pilot and fighter on par with Billy Bishop and the Red Baron, it is believed that Mannock was almost blind in one eye- an amazing challenge for a fighting ace. As a commander of the 74 Squadron he was one of the world’s first theorists on aviation tactics. But Mannock’s success in the air had its toll. Closer to the end of the war, he would have fits of shaking uncontrollably. He kept a pistol with him when he flew in case his plane was attacked and caught fire, he might be able to end his life with less pain than he witnessed on a daily basis. Parachutes were not allowed in the Royal Flying Corps, it was believed that it would encourage pilots to abandon their planes in battle. Personal tragedy had followed his family. On leave in 1917 he visited his family, only to find that his mother had become an alcoholic like his father and his sister had become a prostitute. He confided to a close friend that he had wished to marry, but that never would. The only pictures of him are in monochrome, but portray a man with full lips, strong nose and high cheekbones-he is a handsome man. The last picture of him was found by accident in a French farmer’s photo album. His arm rests awkwardly on a young girl who stares intently at the camera. His eyes, while possibly squinting from the midday sun look sad- as if he has stumbled upon the photographer, or the photo was a request. In 1919 Mannock’s father was presented with his son’s Victoria Cross and the other medals Mick had earned. They were promptly sold; a scandalous tribute for a young man and son who had sacrificed his life for his country. This entry was posted in 1900-1914, historical, World War One and tagged 74 Squadron, ‘Mick’ Mannock, Edward Mannock, Royal Flying Corps, The Great War, World War One. Bookmark the permalink.